Mt. Everest deadliest day ever avalanche: Sherpas killed in accident. 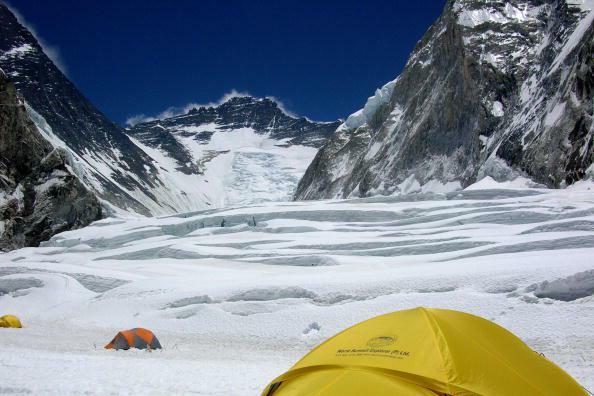 Camp 2, from a picture taken in 2009. The Sherpas were at an altitude of 5,800 meters, or 19,000 feet, when the avalanche hit, according to Madhu Sudan Burlakoti, joint secretary for the Tourism Ministry. He said that four people were also missing and that six had been injured. Some of the deceased were fixing ropes for climbers. Everest is 29,000 feet tall, and the disaster occurred below Camp 2—the second of four camps between base camp (which is at around 18,000 feet) and the peak. Per the AP, climbers and guides currently on the mountain are still in a preparatory stage, as weather conditions won’t allow them to actually summit the mountain until next month. In 1996, eight people died in what had previously been the deadliest incident in Everest history, which was documented in Jon Krakauer’s book Into Thin Air. Update, April 22, 10:35 a.m.: This post has been revised to reflect the latest death toll.